Who are the folks making s*#t happen in the world of sustainability? Big names are making a big difference, but so are grassroots movements that are galvanizing community level change. Movements like Occupy Wall St., the People’s Climate March, and 350.org are making huge strides, but so are huge companies that are changing business as usual to make it easier to live a greener lifestyle. 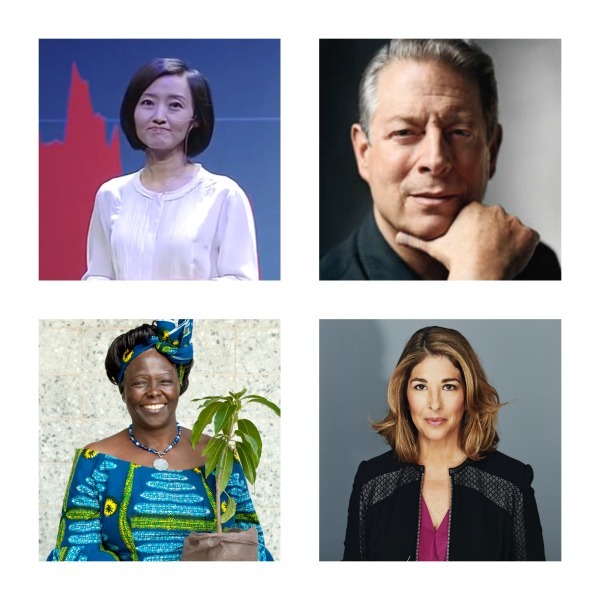 Read on and prepare to be inspired towards action by these top 10 most inspiring sustainability leaders. Naomi Klien: An award-winning journalist and author, Klein’s newest work has brought her into the climate spotlight. This Changes Everything: Capitalism vs. the Climate brings to light the connections between the relentless growth model of the free market economy and its destructive force on the climate. Klein writes that the current rules of the economy must be broken in order to rein in corporate power, rebuilding local economies, and reclaim our democracies. Bringing together movements from all over the world, Klein knows that we have the power to make the changes needed, we just need to know it ourselves. Here’s a hour long talk from the Guardian featuring Klein. Elon Musk: Musk is a entrepreneur to be admired, changing your life even if you’ve never heard of him. Musk is the founder of Solar City, SpaceX, co-founder of Paypal, and currently the CEO and product architect at Tesla, an electric car company that is making record sales with their luxurious yet insanely practical electric vehicles. Musk is everywhere now, and is outspoken about our dependance on fossil fuel-based economy. Watch the best Elon Musk interview here on Planetsave. Al Gore: Former Vice President of the United States, Gore didn’t slink into the shadows after his stint in the White House. Instead he created a huge following with his passionate and practical approach to climate change. His foundational documentary, An Inconvenient Truth, was followed with activism on a grand scale. He’s since created The Climate Reality Project and hosts trainings around the world for activists to bring attention to the reality of climate issues we face. His newest venture: partnering with Pharrell Willams for the Live Earth concert, expecting to draw crowds into the billions around the world to rock out for climate change on seven continents– including Antarctica– in June 2015. Bill McKibben: Educator, writer, and ‘unlikely’ activist and writer McKibben is the founder of grassroots organization 350.org, a global group of activists pushing for divestment, engagement in local climate action, and bringing awareness to the seriousness of our climate reality. McKibben says at no other time in history is it more apparent that this global warming is indeed global, and his work with 350.org is grounded in the international. Projects include Global Divestment day and peaceful demonstrations and protests to bring the frightening truth of climate change to the forefront of political debate. Wangari Maathai: Recently passed founder of the Green Belt Movement, Maathai was a long-time activist focused on women’s rights and climate change with her organization in Kenya. Realizing the women were facing the brunt of ecological problems, the group came together to plant trees, improve local climate issues and build community around justice. The Green Belt Movement continues to be active today in Kenya, US and UK planting trees to improve local (and global) climate issues. Caroline Farrell: The organizer behind the Center on Race, Poverty and Environment, a foundational non-profit working to provide assistance to grassroots groups in low-income communities and communities of color. The organization is grounded in the idea that climate change is a social justice issue, as lower-income communities and populations are the ones that are most affected by climate change with the least amount of resources. Annie Leonard: The driving force behind the clever and pragmatic Story of Stuff series. Story of Stuff– and offshoots Story of Cosmetics, Bottled Water, Electronics, Cap and Trade and dozens more– brings sustainability issues to light in a way that engages even the most skeptical citizens. The short films tell the story of why things the way they are, and how we can create solutions in our daily life to some of the vexing problems of our consumerist culture. Leonard is now the Executive Director of Greenpeace USA, working to bring awareness to the biggest issues on the planet. Watch the Story of Stuff here. What climate leaders do you admire? What names (big and small) did we leave out from the list? Let us know in the comments below.